Today being February 14th is Bon St. Valentin! I would like to wish you all a very Happy St. Valentine’s Day. I remember the very first Valentine’s Day with my husband. We had only met in the middle of January and were only dating for only about a month back in 1967. After getting home from school the door bell rang where I was living with my parents in an apartment in Brooklyn. My mother answered the door and came running in to me saying it was a delivery for me. She was so excited and I couldn’t imagine why. I went to the door and there was a man standing there with the biggest red box tied with the biggest red bow that was 4 ft. all around which was the biggest box of Loft’s chocolates. Back then Loft’s was a very popular chocolatier. I never saw anything like it before, except as the display in the Loft’s Chocolates store window as the big display. I tipped the delivery man, later to find out that it was my husband’s friend. My mother, father and I enjoyed those chocolates I think until Halloween! It remains one of my favorite memories of Valentine’s Day until today and we often speak of it. As for myself, I have everything. I don’t need a special or fancy dinner, boat cruise or night out at a soirée or anything like it. I thank God everyday that I have my husband of 41 years and celebrate the years we have had and the many I hope to have together yet to come. After all, I am in Paris the city of love, what more does a girl need? I already have the love of a very good man. This morning at about 6:45 AM I went out onto the balcony in my hat and robe. It is a little damp, and still a little dark. I glanced at my reflection in the door and I have a purple hat on with a long black robe. I reminded myself of the little tale about the woman who wears purple and a red hat, which doesn’t go together etc. I don’t know if you know what I mean, but it is a popular story. But, today I will wear a red sequined top with a black sweater, skirt, black tights and high black boots with a bright red beret. My husband just got up and joined me on the balcony. I retreated to the kitchen to get coffee and returned back to the balcony and presented him with a hot steaming cup of coffee which he appreciated, and then he said as he kissed me, “Happy Valentine’s Day.” I am blessed with a good marriage and the most wonderful man in the universe, what more could I possibly need. Today is about celebrating love. Whatever you do if you go to the theatre, see a movie, have a special dinner, or stay at home to watch television, have a happy St. Valentine’s Day. As for myself a good old box of Russell Stover would do the trick. Enjoy, life is short. 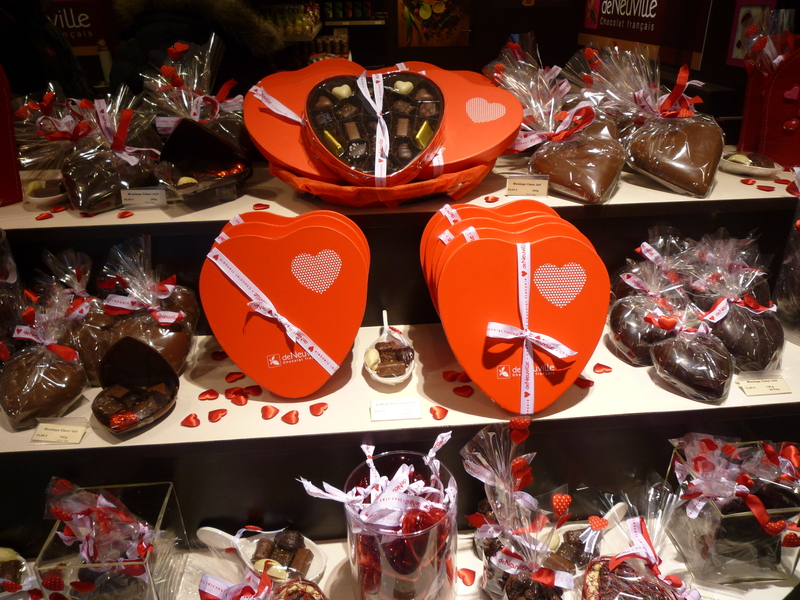 This entry was posted in BON SAINT VALENTIN and tagged BON ST. VALENTIN, PARIS, ST. VALENTINE'S DAY. Bookmark the permalink. 1 Response to BONNE SAINT VALENTIN DAY! 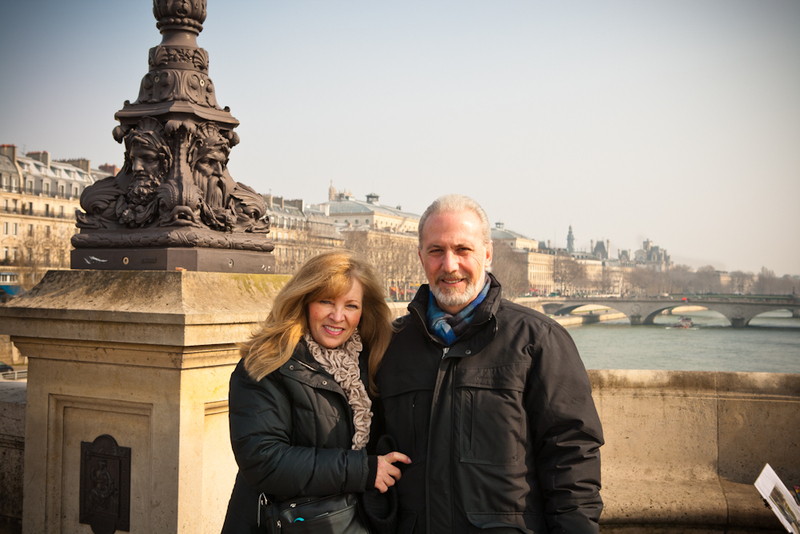 Happy Valentine’s Day to you and Mike in Paris!!! Enjoy a wonderful macaroon for me!! Phil & I went to our favorite restaurant here, and as always, it was wonderful! And now I am with my favorite little valentine, Jackson! He brought me a big red dog that he picked out himself when my son brought him into the store to buy something for me! How cute is that!! Have a fun Valentine’s Day!!!!!!!!!!!!!!!!!!!!!!!!! !